Menulog delivers for Turkish Pide House - Woden so you'll be able to track your courier on a map. Inlcludes your choice of dips, Turkish bread, chicken skewers, spicy meatballs, Turkish pides (gourmet pides $1.50 extra, seafood pides $2.00 extra), rice, salad, and soft drink. Includes your choice of dips, Turkish bread, zuchinni puffs, fetta cheese rolls, Turkish pide of your choice, falafel, tabouli, seasonal vegetables and rice. Includes chargrilled lamb and chicken skewers, lamb cutlets, spicy meatballs, rice and salad. 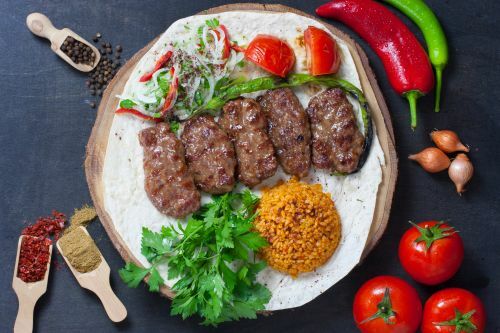 Includes your choice of dips, Turkish bread, zucchini puffs, Turkish pide (gourmet $1.50 extra), lamb skewers, chargrilled chicken, spicy meatballs, rice and salad. Includes your choice of dips, Turkish bread, zuchinni puffs, fetta cheese rolls, Turkish pide, garlic bread, lamb cutlets, chargrilled chicken breast pieces, chargrilled prawns, rice and salad, baklava. 4 x Small Dips, 1 x Turkish Bread, 4 x Zucchini Puffs, 1 x Garlic Bread, 3 x Pides. Seasonal vegetables cooked in Turkish pepper paste, onions, capsicum and oregano. Feta cheese rolls wrapped in filo pastry and lightly fried. Turkish style vegetarian lasagne layered with ricotta and Parmesan cheese. Zucchini puffs with yoghurt dill dressing. 3 x Zucchini Puffs and 3 x Feta Cheese Rolls. Turkish salami cooked with Roma tomatoes, sauteed onions, capsicum and spiced with cumin. Served with tabouli and hummus. Beetroot, carrot, eggplant, hummus, cucumber or capsicum and walnut. Any selection of 3 dips. Vine leaves stuffed with rice and currants. A mix of our sensational dips and Turkish bread. All mains are served with rice and salad. Spicy chargrilled meatballs infused with smoky pepper paste, parsley and aleppo chilli. Oregano infused chargrilled lamb skewers. Paprika and garlic infused chicken skewers. Thinly sliced organic chicken infused with cumin, thyme and Dijon mustard served on mash. Garlic, paprika and thyme infused chargrilled chicken breast. A selection of our chargrilled kebabs inlcude lamb cutlet, chicken, lamb skewer and meatball. Cowra lamb cutlets, cumin and oregano infused. Smoked pepper and garlic infused QLD prawns. Chargrilled Atlantic salmon seasoned to perfection. Market fish simmered in creamy sauce with sauteed vegetables. Onion, tomato, capsicum, Cheddar and feta cheese. Baby spinach, cumin potato, onion, capsicum, tomato and Cheddar cheese. Roasted chicken pieces with cheese and pineapple. Sliced Turkish olives, mushroom and cheese. Spicy Turkish smoked salami, parsley and cheese. Braised lamb, parsley, capsicum, onions and cheese. Diced lamb pieces, finely chopped onions, tomatoes, capsicum and oregano. No cheese. Baby spinach, garlic, Cheddar and feta cheese. Roasted organic chicken pieces, onion, capsicum, tomato and mushrooms with a hint of BBQ sauce. Smoked Turkish beef prosciutto and Cheddar cheese. Tender beef strips, oregano, tomato, onion, capsicum, Turkish olives, feta and Cheddar cheese toppped with yoghurt mint sauce. Tandoori style chicken with mushroom and spinach. Turkish pepperoni, capsicum, onions and cheese with a hint of BBQ sauce. Smoked eggplant, sun-dried tomato, artichokes, capsicum, onion, Cheddar and feta cheese topped with pesto aioli. Rosemary pumpkin, cumin potato, onions, capsicum, feta and Cheddar cheese topped with pesto aioli. Roasted organic chicken pieces, onions, capsicum, Cheddar cheese topped with yoghurt mint and chilli aioli. Spicy Turkish salami, Turkish olives, cheese, tomato and basil aioli. Organic chicken pieces, sun-dried tomato, baby spinach, onions, capsicum and pesto aioli. Meat lovers including chicken, braised lamb, pepperoni, onions, capsicum and cheese topped with BBQ sauce. Garlic prawns, mushroom, tomatoes and cheese. Garlic and basil prawns, baby spinach, tomato, capsicum and sweet chilli sauce. Salmon, prawns, garlic, mushrooms, tomato and cheese. Mesclun leaves, Roma tomatoes, Lebanese cucumber, feta and olives with a balsamic vinaigrette. Sumac infused and finely chopped tomatoes, Lebanese cucumber, Spanish onions with olive oil and tangy dressing. Chargrilled chicken pieces served on Roma tomatoes, cucumber, rocket and mesclun leaves. Grilled salmon, prawn and calamari with balsamic and pomegranate dressing.